According to the Center for Disease Control, an estimated 10 million international travelers experience some form of Travelers’ Diarrhea. It is an infection of the stomach and intestines that is primarily caused from bacteria. In fact, over 80% of the cases of Travelers’ Diarrhea are from common infectious bacterial agents. How this bacteria gets into your body is simple. We all need to eat. The problem is that many countries do not have strict food regulations. When food is ill prepared or mishandled, this gives the bacteria that causes Travelers’ Diarrhea a chance to thrive. Once the bacteria enter your body, it needs to set up shop and reproduce. Typically, travelers may not experience any symptoms for a few days. 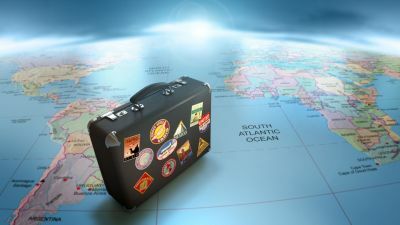 If a traveler comes into contact with the bacteria towards the end of the trip, the infection may not be noticed until after the traveler is back in their home country! To the average traveler, this type of short-lived infection may not be that big of a deal. For those with previous or current medical conditions such as bowel disease and stomach cancer, Travelers’ Diarrhea could dangerously increase your risk for a more serious infection. It’s important not to mistake Travelers’ Diarrhea for Irritable Bowel Syndrome. Travelers’ Diarrhea is short-lived, usually lasting no more than a week in most cases. It is caused by a bacterial infection and typically resolves itself. Irritable Bowel Syndrome, on the other hand, has no direct cause and needs to be managed over the long term. It usually involves diarrhea but is also accompanied by bouts of pain and constipation. Irritable Bowel Syndrome can be triggered by certain dietary and lifestyle choices. Drinking coffee and experiencing stress are two popular examples. If you believe you have Irritable Bowel Syndrome, you should talk with your doctor before traveling to developing countries. Why Don’t I Get TD When Traveling in my Own Country? If Travelers’ Diarrhea is so common, why don’t you seem to experience it when traveling within your own country? Everything from the type of food to how it is prepared is nearly universal within a specific country. For instance, food that is prepared for you in Philadelphia, PA is going to be handled and prepared nearly the same in San Francisco, CA. Despite being on opposite ends of the country, these two states have agreed to a specific standard of food handling and preparation. What’s more, there will not be great variations in the types of bacteria you find in the water and food supply within the same country. When traveling thousands of miles away, you are encountering an entirely new bacterial community that your body has never encountered before. The result is Travelers’ Diarrhea. If you stay in that new country long enough (e.g. – When moving abroad to teach ESL), your body will eventually adjust to these conditions and new types of bacteria. The greatest risk factors can be divided into the following categories: types of people and countries to take the greatest precautions in. You should always take precautions in any new country you travel to, especially in developing countries. The following is just a small list of countries was noted as areas to take a great amount of caution in while traveling. In the end this list is not exhaustive, and you should be cautious when traveling to any country. It’s best to prevent Travelers’ Diarrhea rather than have to treat it. Let’s break down the best ways to prevent Travelers’ Diarrhea through actions, food choices, and supplementation. Wash your hands! Bring along a hand sanitizer if you won’t have access to clean water and soap. Thoroughly wash any items that will be coming into contact with your body. For instance: utensils, clothes, etc. Aside from changing the way you eat, you may also want to look for help from medications. Here is a list of the common medications that people take for Travelers’ Diarrhea and their level of effectiveness. The following medications are all antibiotics that have been used for Travelers’ Diarrhea. These antibiotics, while having some success, have all had serious side effects reported including the damaging of healthy gut-friendly bacteria. You may destroy the bacteria causing Travelers’ Diarrhea but your immune system and flora of gut-supporting bacteria will be compromised. The following medications are designed specifically to treat the symptoms of diarrhea. While these medications have been found to be effective, they also come with the risk of side effects including hives, stomach pain, bloody stool, and fast heart rate. These prescriptions will be ineffective for anyone with a serious stomach-related disease. The following over-the-counter remedies are an easy to access solution to Travelers’ Diarrhea. Although they do not treat the direct cause of TD, they do help alleviate the symptoms. Both act as an anti-inflammatory, helping to sooth that bloated feeling. They also slow down the movements of the stomach, helping to reduce the constant urge to go to the bathroom. Again, while effective at reducing symptoms, they do not treat the direct cause. If you want to avoid problematic medications and over-the-counter options, then supplementing your diet is the best option. In particular, probiotics allow you to support your body’s natural ability to fight off the bacterial infection. Probiotics also support your immune system, aiding in the process of adjusting to the presence of the new bacteria. Are there food sources of probiotics? If you happen to run out of probiotics or you simply can’t find a reputable brand, then there are several food sources you can take advantage of. Fermented foods such as yogurt, kefir, sauerkraut, and kimchi all contains extremely high levels of probiotics. What’s more, some of these food options are regional, helping you adjust to that area’s bacterial community. Don’t I need to refrigerate probiotic supplements? While some probiotics do require refrigeration for optimal performance, there are just as many that are shelf stable. Probacto probiotics, for instance, is a great solution for Travelers’ Diarrhea and it does not need to be placed in a refrigerator. If you’re looking for a specific brand, Probacto probiotics are one of the best. It provides you with a wide range of bacteria that have been proven to complement your intestinal gut flora. Traveling is a life changing experience. You shouldn’t have to limit your adventures because of Travelers’ Diarrhea. TD is a frustrating illness that is unpredictable and embarrassing. There are plenty of ways to prevent TD from occurring including taking care to wash your hands and avoiding contact with contaminated foods. If you want to fortify your body then you need to supplement with a scientifically proven probiotic product. Choose Probacto probiotics to safeguard your stomach and your adventure. vol. 137 no. 3 803S-811S.